You have undertaken to vindicate the law, in the Court of Queen’s Bench, ‘before the Queen herself, and by the help of the worthy Chief Justice. Truly, it was high time. I am no advocate for ‘liberty of the Press;’ To think no man can commit a much graver crime than exciting discontent against government and laws, wherever there are government and laws. 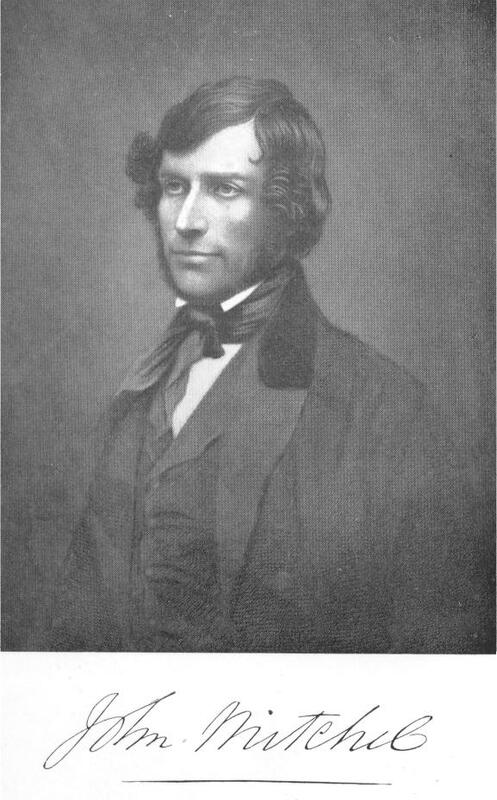 I hold that in any well-ordered State—in any State, indeed, that has a pretence of government at all, such a society as the Irish Confederation—such a Journal as the UNITED IRISHMAN—ought not to be suffered for one week to pollute the social atmosphere with its poison: it is a nuisance, a scandal, and ought to be abated quickly and put out of sight, if not by the indignation of the community, then, surely, by the strong arm of the law. But the case is this:—I assert and maintain that in the Island of Ireland there is no government or law—that what passes for ‘Government’ is a foul and fraudulent usurpation, based on corruption and falsehood, supported by force, and battening on blood. But your lordship, on the other hand, maintains, I presume, that the thing called a Government is not a Foreign usurpation, but one of the ‘institutions of the country’—that the persons composing it are not robbers and butchers, but statesmen— that their object is not the plunder and starvation of the people, but the good order and peace of society, the amelioration of social relations, and the dispensation of justice between man and man. Here are two very distinct propositions: and it is impossible they can both be true. Either there is a Government or there is none; law or no law:—either the Confederation and the UNITED IRISHMAN are a nuisance, or else you are a nuisance. You ought not to have suffered our existence so long, or else we ought to have extinguished yours. You and we are mortal enemies and now that issue has been happily joined, I fervently hope it will result in the utter destruction of one or other of the parties. When I speak of your destruction, my lord, I mean only official extinction; the abolition of that Government of which you are agent ;—when I speak of ours, I mean our death on field or scaffold, by your weapon of ‘law,’ or your weapon of steel. I mean, simply, that we will overthrow your Government, or die, This trifling prosecution for ‘sedition’ is but a beginning: you have invited us to fight you on the battle-ground of ‘law’—depend upon it you shall have enough of it: the resources of this ‘law’ of yours will be taxed to their very uttermost; I already hear your courts ringing with ‘sedition,’ boiling over with high treason, pouring forth manifestoes of rebellion from the very temple of Justice (as the Chief Justice’s den is called), to fly by myriads and millions over the land, until every cabin in the Island shall echo with curses upon Foreign law and Foreign governors. If the cause do come to be tried before a jury, there is one stipulation I would make: — your lordship already guesses it; need I repeat it? Why should you pack a jury against us? Remember, my lord, you belong to that liberal and truly enlightened party called ‘Whigs;’ it is only a ‘Tory,’ you know, who packs;—and remember, also, that although I deny the lawfulness of your ‘law’ and your law-courts altogether, and hold a trial for sedition before a packed jury in Ireland quite as constitutional a proceeding as a trial before an unpacked one, yet your lordship cannot take this view of the matter. Your case is that there is law in the land—that we have broken that law, and are to be tried by that law. Remember, therefore, all the fine things that your jurists and statesmen have said and written about the great palladium of British liberty and so forth: remember how the learned Sir William Blackstone hath delivered himself on this point;—how that ‘the founders of the English laws have with excellent forecast contrived that the truth of every accusation, whether preferred in the shape of indictment, information, or appeal, should be confirmed by the unanimous suffrage of twelve of his (the accused person’s) equals and neighbours, indifferently chosen, and superior to all suspicion.’ A trial for ‘sedition’ here is a mere political voting, and as your faction (that is, the English faction,) have held the sole appointment of all the officers and clerks employed in that business, they have always been able by stealing lists, or juggling and falsifying cards, and numbers, to secure twelve men who will vote for the Castle, and find anyone guilty whom the Castle does not love. This method of applying the British palladium to Irish affairs is as old as the introduction of the said palladium into our Island. [See Edmund Spencer; Eudoxus and Irenœus] Of late years the requisite management cannot be resorted to so openly. But your lordship knows how the trick is done. You know that when the trial of the seven Repeal conspirators was approaching, somebody stole one of the lists containing the names of the special jurors, so that those names never went into the ballot-box at all; you are aware also that the operations of the ballot itself are mysterious; and that, in short, by one contrivance or another, your Juries are always well and truly packed. I suppose your lordship was never actually present in the Crown-office while the balloting was going on. I will describe it to you. First, then, you are to suppose that the list of names has been delivered safely by the Recorder to the Sheriff, and been by him duly numbered, and the number of each name written on a separate card—that the list, in fact, the whole list, and nothing but the list, is now actually in the ballot-box, faithfully numbered to correspond with the Sheriff’s book—you must suppose all this, albeit I know a rather violent supposition;—and then, in presence of the attorneys for the Crown and for the accused criminal, forty-eight cards are to be taken out of the box. On one side of a table stands a grave-looking elderly gentleman with the ballot-box before him; on the other side sits a second still more grave, with an open book; in the book is written, each several numbers, on the margin, and opposite the number the name of the juror thereby denoted. The first grave gentleman shakes the box, puts in his hand, and takes out a card, from which he reads the number—then the other grave gentleman turns to that number in the book, and pronounces the name of the juror so numbered, whose name and address are then taken down as one of the forty-eight; and this process is repeated forty-eight times. Now it is painful to harbour any suspicions of such grave-looking elderly gentlemen: but you know juries are packed; that is an absolute truth; and somebody must be the villain. Well, then, it is said—I say nothing, but it is said—that those two gentlemen know each juror just as well by his number as by his name: and so, when the first takes out a card and finds 253, for example, written on it—if he knows that 253 would vote for the people, and against the Crown, it is said he gives out (as solemn as he looks), not 253, but, say, 255, or some loyal number; and thus a safe man is put on the list. Or, if anyone is standing by, and has an opportunity of seeing the card, he cries 253, and winks, or otherwise telegraphs to this other grave gentleman. Then the onus is upon the man with the book, who has nothing to do but call out a loyal man for the disloyal number, and so you have safe voters still. They never make the mistake, these elderly gentlemen, of turning out the whole forty-eight all of the right sort there is no need: there is a margin to the extent of twelve: and so they generally leave about nine or ten dubious names amongst the forty-eight. The Crown has afterwards the right to strike off twelve peremptorily, without reason assigned, and always gets rid of the men who would vote for the people. Thus, my lord, your jury is safely packed, and your verdict, or rather vote, is sure. They poll to a man for the Crown.